Bobby Lee’s commute probably doesn’t start too differently from yours. He wakes up at his house in Oak Grove, Mo., says goodbye to his wife and gets in the car. But then he travels an hour to Kansas City International Airport, where he boards a Southwest flight to LaGuardia. Then he heads to Citi Field, where he sells beer for 70 or 75 of 81 home games a year. 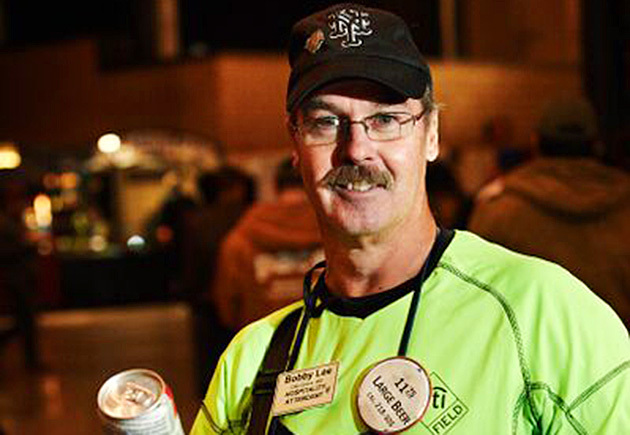 Lee, 56, comes from a long line of ballpark workers. His grandfather was an usher at Yankee Stadium for more than 40 years and his father did the same job at the Polo Grounds. When he was 15, Lee earned spending money selling soft drinks at Jets games at Shea Stadium. He added the Mets to his rotation later in high school and eventually graduated to selling cotton candy, which he did part-time all through college. Even when he got a job at the Flushing post office, he would head to Shea after it closed at 3 p.m. Even when he started as a New York City firefighter with Engine 261 in Long Island City, he moonlighted with the Mets. But he retired from 20 years with the fire department after 9/11, and his wife’s company asked her to move to Kansas City in 2003. The deal was that they would move—but Lee would keep his job. He works Chiefs games in the baseball off-season and he’s picked up some shifts for the Royals, but it takes time to earn a spot high in the pecking order, and it was worth it to him to keep his at Citi Field: He was promoted to beer, the big earner, in 2009. He’s got it down to a science. In between stints jogging up and down the stairs of Section 122, he camps out by the exit to the men’s bathroom and virtually prints money. The financials of it all might seem curious—flights to and from 10 homestands add up—but Lee has done the calculations and come to a frightening conclusion. The stars aligned for him on this World Series: He worked the first two games at Kauffman Stadium and has been at Citi Field since, where he’s a beloved figure. His regulars look out for the guy with the unexpected hometown on his nametag and Aramark, the company that sells refreshments at both ballparks, honored him at the 2013 All-Star Game, held at Citi Field. He’s popular on his flights, too, where he often runs into the same people (“I tell them I’m in the sugar industry,” he said with a wink). It might seem an unsustainable pace, but Lee shows no signs of slowing down.